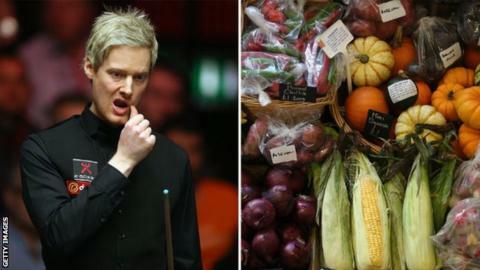 A vegan diet has put Neil Robertson "in the best nick of his career" as he seeks a second World Championship. The Australian, 33, changed his diet after guidance from strict vegan Peter Ebdon and says his energy levels and concentration have improved. Cups of coffee have been replaced by banana smoothies, with meat and animal-derived foods off the menu. "I haven't prepared as well for a World Championship, or any tournament, as I have for this one," said Robertson. Snooker's world tour has a cluster of players, including Aditya Mehta and Liam Highfield, who stick to a vegan diet, which typically consists of plant-based foods such as grains, beans, vegetables, fruits and nuts. In 2013 The Vegan society estimated there were 150,000 Vegans in the United Kingdom. Robertson, champion in 2010, claims he feels "fantastic" since he acted on Ebdon's advice late last year. His own research into athletes such as Carl Lewis, who lived on a vegan diet, also proved influential and good form, including a final defeat to Shaun Murphy at the Masters in January has followed. "I've not looked back since," said Robertson, who says other players - such as Joe Perry - are monitoring his progress with a view to copying the move. "I used to feel very tired during tournaments. I was drinking four or five coffees per day and felt I needed more. Now I'm able to practice an awful lot more without getting tired." Ebdon, who won a gruelling 18-17 final against Stephen Hendry in 2002, takes a juicer and blender to events. The vegan of four years said: "It's improved my game in every single area. My recovery times are much quicker. I just feel amazing all the time."